Industry leader for multiple monitors. More than 50 multi-screen LCD displays. Powerful multi-monitor computer workstations. Custom laptops and multi-monitor laptop docks. Support for Windows 7 and Windows 8. 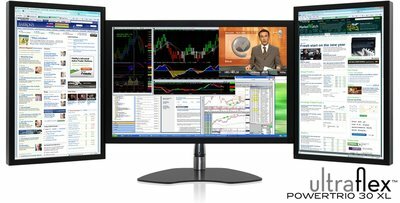 Digital Tigers offers by far the most complete multi-monitor product line in the world. 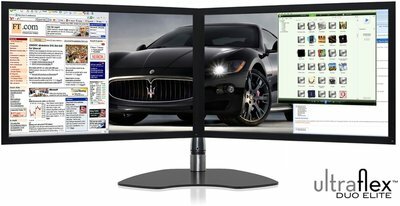 Our mission is to provide complete multi-monitor solutions that work together seamlessly -- from multi-screen desktop displays (Zenview and UltraFlex), to desktop workstations (Stratosphere), to custom laptops, to laptop multi-monitor docking stations (SideCar), to multi-monitor software utilities (UltraView Desktop Manager). If you need help turning it on, please call Digital Tigers at the number on the masthead. 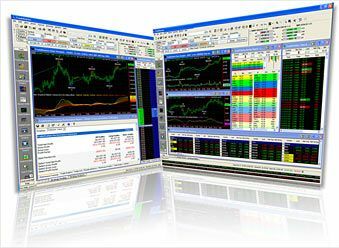 Digital Tigers announces the all-new Stratosphere Evolution professional workstation series, focused on the high performance, reliability and value requirements of demanding financial traders and other professional users. Systems feature Intel's new 6-core Core i7-5820K Extreme Edition processor, upgradable to Intel's new top-of-line 8-core Core i7-5960X processor. For even higher performance, top-of-line Stratosphere Evolution configurations unleash Intel Xeon workstation processors with up to 18 cores. These new-generation processors are Intel's Haswell-E and Haswell-EP series, respectively. The new models feature new motherboards with Intel X99 chipset and industry-fastest Samsung 850 Pro solid-state drives (SSDs) backed by a 10-year warranty. The new Stratosphere Evolution features a dramatic new system case with sculpted gunmetal styling. Also available in black, white or red, the new case delivers superior cooling power with three premium quiet fans and optimized airflow. A fan speed controller allows customers to optimize ultra-silent (inaudible) case fan cooling or highest cooling power. 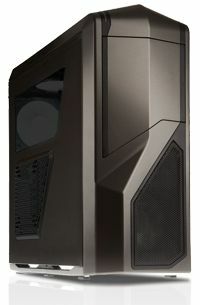 For those wishing the ultimate in quiet cooling, a Fractal Design ultra-silent case option is also available, featuring sound-dampened side panels and door. NVIDIA Quadro professional graphics: the #1 choice for professional workstation graphics, with all-new Quadro K620, K2200 and K4200 models featuring twice the memory and performance of prior models. More pro applications are certified for NVIDIA Quadro than for any other graphics card brand. NVIDIA Quadro graphics upgrades are available for most Stratosphere Evolution models. AMD FirePro professional graphics: the value choice for professional workstation graphics, delivering pro-quality graphics at new low price points, fast performance, and the best support for multiple DisplayPort monitors. AMD FirePro W4100 drives the starting configuration for several different Stratosphere Evolution models. NVIDIA GeForce consumer graphics: the price/performance choice for fast mainstream graphics, offering ultra-fast performance at the lowest price points, with especially fast gaming performance. NVIDIA GeForce GTX 750 Ti drives the starting configuration of two models. The new models all feature a Z or X prefix in their models names, such as Stratosphere Evolution Z6. Z-series models: optimized for DisplayPort monitor connections. X-series models: optimized for DVI or HDMI monitor connections. The number following the letter represents the number of monitors supported. So, Stratosphere Evolution Z6 supports six DisplayPort monitors, while Stratosphere Evolution X6 supports six DVI or HDMI monitors. Stratosphere Evolution starts at $2,399.00 USD and is available immediately. All models can be customized extensively online or via quote request. 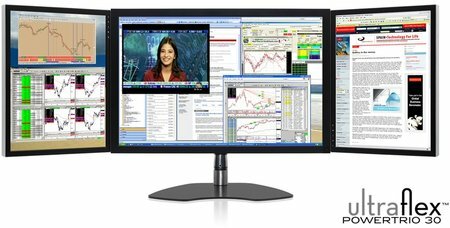 For a complete solution, combine any Stratosphere model with a Zenview multi-screen monitor and get 10% off the price of the display. TradeStation teams up with Digital Tigers for 100% rebate on trading computers! Active traders can get up to $8,000 money back on new Digital Tigers trading computers and multi-screen monitors, through rebates on TradeStation commissions. 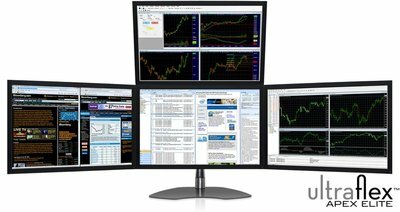 This amazing program enables traders to customize and purchase their dream trading computer setup, combining any Digital Tigers trading computer and multi-screen display. TradeStation will refund the entire purchase price, up to $8,000, through discounts on TradeStation brokerage commissions. "TradeStation is delighted to work with with Digital Tigers and offer this great rebate program to Digital Tigers customers," said John Bullock, TradeStation Active Trader Sales Manager. "With our new rebate program, active traders can rebate the full cost of Digital Tigers computers and multi-screen displays through monthly discounts on their TradeStation commissions, up to $8,000 total rebate," Bullock continued. "All that is required is the opening of a new TradeStation account." New and existing TradeStation customers are eligible, so long as they open a new trading account to earn the rebates. For example, customers can transfer an IRA account or open a new trading account for an additional asset class. Once enrolled in the program, customers earn rebates until the earned value is consumed. Active traders can rebate their full purchase price in two or three years. The program has four purchase tiers: $2,000, $4,000, $6,000 and $8,000. Purchases below each level are rounded up to the next level for rebate value. For example, a $6,100 trading computer purchase earns an $8,000 rebate. TradeStation is an award-winning online brokerage firm and trading platform. In March 2012, Barron's magazine, in its annual review of 24 online brokerage firms, awarded TradeStation its highest overall star ranking (41/2 stars), as well as Best for Frequent Traders, Best Trading Experience and Technology and Best for International Traders. Also in March 2012, TradeStation won for Best Trading System -- Stocks, Best Trading System -- Futures, Best Institutional Platform, Best Professional Platform, Best Online Analytical Platform and Best Real-Time Data in the annual Readers' Choice Awards given by Technical Analysis of Stocks & Commodities magazine. World's first dual, triple and quad-screen LCD arrays with independent articulating arms ... on a desk base! Articulating arms enable complete independent movement for each LCD: forward / back, lift, tilt, pan and rotation. Patented suspension system supports even 24" monitors with easy fingertip positioning in triple and quad arrays, and up to 30" monitors on dual arrays. A freestanding desk base is standard, enabling UltraFlex displays to be installed by anyone, on any desk, in minutes. UltraFlex arrays also include a desk clamp and grommet mount (standard), as space-saving installation options. Affordable wall mount options are also available. UltraFlex arrays typically cost only $100 more per screen than equivalent fixed-position multi-screen arrays. UltraFlex arrays are available exclusively from Digital Tigers. See models and pricing, lower right. With UltraFlex, Digital Tigers has developed and introduced the world's best mounting solution for multi-screen LCD arrays. This stunning solution has to be seen and felt to be believed. With striking industrial design and polished aluminum surfaces, UltraFlex offers great looks and amazing flexibility. The arrays invite attention, and the flexibility invites new productivity. Tilt your screens back and lift them up ... and you have an array perfectly positioned for standing. Turn a monitor toward a colleague and extend it forward during a meeting. Rotate one or more screens into portrait mode, whenever desired. Fold the side screens inward, or push them back flat. Tilt the top-row monitors down, and the bottom-row monitors up. Almost any position you can conceive, you can do with UltraFlex. Articulating arms have traditionally been cumbersome devices requiring fixed attachment, while supporting only one or two screens. UltraFlex brings the freedom of installing up to four screens on any desk, thanks to the unique freestanding desk base and flexible attachment system. By 10:1 margin, customers have told Digital Tigers that they prefer the simplicity of freestanding desk bases, over fixed attachment options like wall mounts. UltraFlex brings complete installation freedom. The unique 4-in-1 mounting system enables fast setup using a freestanding desk stand, while also including a space-saving desk clamp and grommet mount at no extra charge. Wall mount attachments are available as an option.